Byron Elder, 22, was killed in front of the Williamsburg Houses just after noon on April 28, police said. EAST WILLIAMSBURG — The suspect in the broad daylight shooting death of an aspiring rapper and father of a young toddler outside the Williamsburg Houses turned himself in on Tuesday, police said. 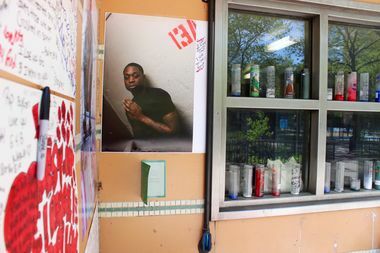 David Green, 33, lived less than a block from where police said he gunned down 22-year-old Byron Elder, a lifelong resident of the nearby Bushwick Houses at 12:29 p.m. April 28. “[He should spend] the rest of his life behind bars and my son haunting him until he dies in jail,” said Sharline West, 41, Elder's mother, who recalled her son as a prankster who loved basketball, was protective of his 2-year-old daughter and loved fried chicken more than anyone she knew. 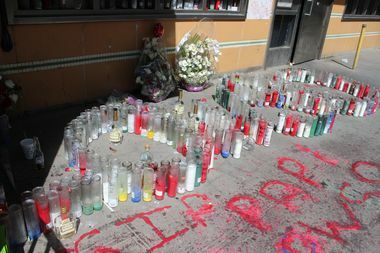 A shrine built in candles outside Elder's Bushwick Houses home read "Lowso" short for his rapper name "Papi Lowso." Elder had recently an album called "Trenches" and went by the name "Papi Lowso," she said. Friends of Elder, who had no major criminal record, showed an outpouring of support on his Facebook page and built a massive shrine in front of the Bushwick Houses spelling out his rapper name "Lowso" in multi-colored candles. His wake is scheduled for Friday from 4 to 9 p.m. at Grace Funeral Chapels at 607 N. Conduit Blvd in Ozone Park. Green, who had prior arrests for assault, robbery, possession of marijuana and aggravated unlicensed operation of a vehicle, surrendered himself under an agreement with 90th Precinct detectives, police said. Green was due to be arraigned in court on Thursday, court records show. No information about his attorney was available immediately. Elder was in front of 203 Scholes St. in the Williamsburg Houses when he was shot to death at 12:29 p.m. The gunfire sent elderly tenants who'd been enjoying the mild afternoon in the nearby park running for cover. Elder's murder is the second shooting death in the vicinity of the WIlliamsburg Houses this spring. On April 11, 28-year-old Tiquan Hamilton was fatally shot inside Martinez Park. As of Thursday, no one had been arrested for his death.